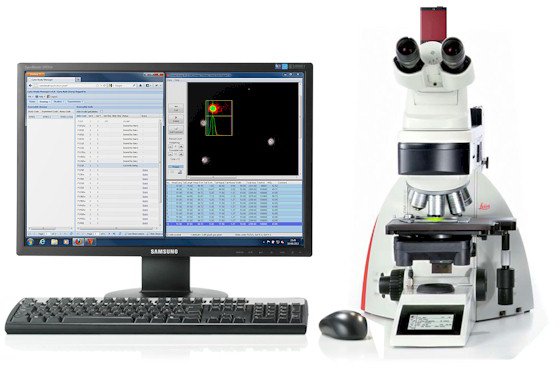 Originally developed by Perceptive Instruments and now part of the Instem solution portfolio, Cyto Study Manager integrates genetox data acquisition, auditing, reporting and study management into a single system. Our GLP compliant solution is revolutionizing genetox study workflows and helping clients to reduce costs, increase efficiencies, and improve regulatory compliance. Cyto Study Manager is a comprehensive and configurable solution, which replaces multiple genetox systems and increases data reliability and traceability whilst saving time and resources. Improves workflows - Around the world, Cyto Study Manager is replacing multiple genetox systems with one comprehensive, easy to use solution. Cyto Study Manager combines experimental set up, data collection and automatic report generation, which saves you time and streamlines your genetox workflows! Delivers results sooner - We are helping clients reduce paperwork and get the answers they need faster than ever before. Study templates allow you to copy previous study designs so you don’t need to worry about re-configuring, re-typing or re-entering setup information. Data collection is integrated with the system and as soon as data is collected, it can be reported. We are speeding up the process! Flexible study design - Our solution works for you. Modules are available for comet, micronucleus, chromosome aberrations and a customizable module, so we can meet your specific genetox needs. Experiments can have multiple stages, multiple test items, several or no control groups! Cyto Study Manager can deal with your experimental set-up, whatever that might be. 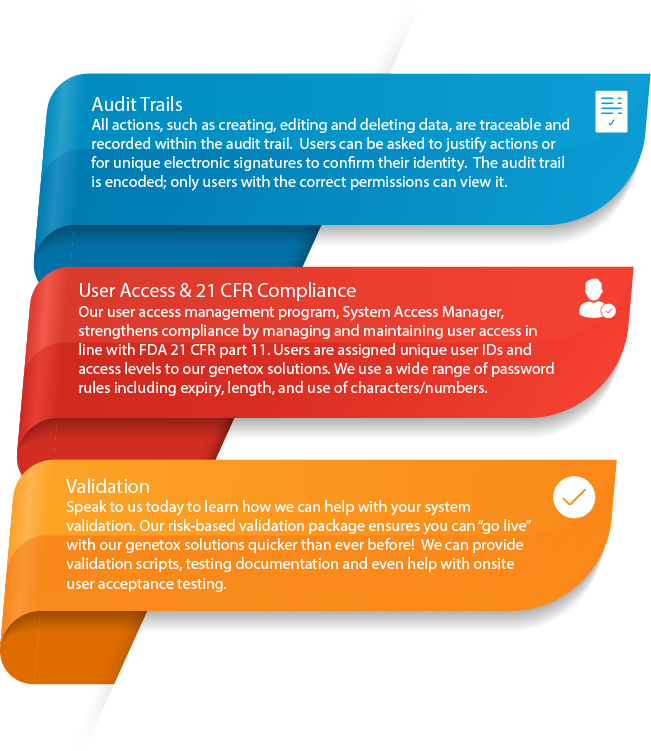 Ensures compliance & increases data traceability - All actions that are carried out within Cyto Study Manager, such as creating, editing and deleting data, are recorded within an audit trail. Cyto Study Manager has been designed with reference to the OECD and S2(R1) guidelines. It is fully compliant with the principles of Good Laboratory Practice (GLP) and the FDA 21 CFR part 11 rule on electronic signatures. 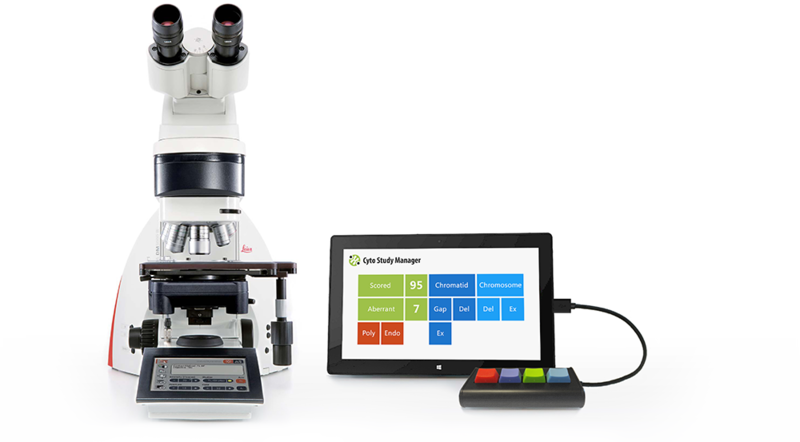 Increases productivity within your genetox team - Access Cyto Study Manager anytime, anywhere! Our solution is a secure network-based system; you can log in from anywhere with access to your company network…the lab, the office or even from home! Multiple users can log in simultaneously - each can be working on the same or different investigations. Produces customized reports & statistics automatically - Reports are generated securely from within the system, they can include sample coding/decoding information, results tables, historical data ranges, audit information and more! Reports can be customized to match your own corporate style, we can even create bespoke data tables, graphs and statistics, should you wish! Because all of this is achieved within one system, there is no risk of transcription errors, no import/export, no file transfers and no copy and paste. Removes experimental bias - When scoring comet, chromosome aberration or micronucleus slides, Cyto Study Manager can present the scorer with a list of coded samples to remove scorer bias. Coded samples are configurable and can be any letter-number combination you need. The sample details are handled invisibly by Cyto Study Manager and the scorer remains “blind” to all experimental information. Cyto Study Manager stores data against the appropriate sample automatically so study directors can review, approve and reject data in real time.